We had one of the funnest, most laugh-infested Circle of Power (Morning Meeting) sessions in my class the other day, as one of my sixth graders brought in a book that she and a bunch of others published when they were in Kindergarten with my colleague, Gail Poulin. (See her wonderful class blog and her own reflective blog). My students shared, with permission of the others, drawings and stories they had either written or had transcribed. As is often the case with Gail, the stories were nicely published together. 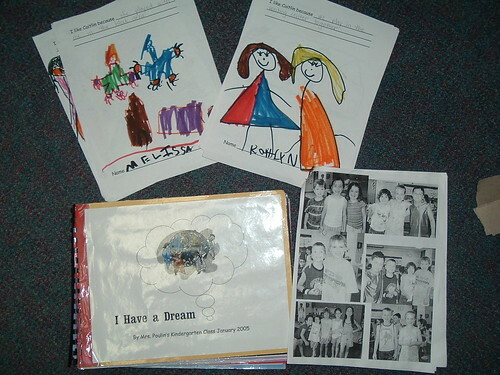 The theme for book was about “I Have Dream” (inspired by Martin Luther King Jr.) and another packet was when one student is “star of the day,” the others write nice things about them and draw cute pictures. Even students who did not have Gail for their kindergarter teacher had a great time with looking at the drawings, and listening to the stories, and remembering a bit about their own kindergarten experiences. It was an unexpected surprise, and we all had a good time. Thank, Gail, for making memories that can impact us up here a the other end of the building. And thanks to the rest of our wonderful kindergarten team, too, who do such a fantastic job with the youngsters in our building. The things they do in those younger grades sets the stage for the learning we try to do in the upper grades. I know I appreciate their hard work. Great idea and story. Not only does it reconnect students with their past, but one they shared with their classmates. This is a great way to rekindle and devlop relationships in the classroom and teach citizenship skills. In my high school classroom, I’m tinkering with the use of a time capsule…which is difficult with seniors, but I like the idea.